22ct gold base studded with white sapphires and un-cut rubies strung on nine natural seed pearl strands. Set in the traditional Jadau layout technique, the upper tier has a floral design pattern while the lower tier is marked with a crisscross symmetric flow. 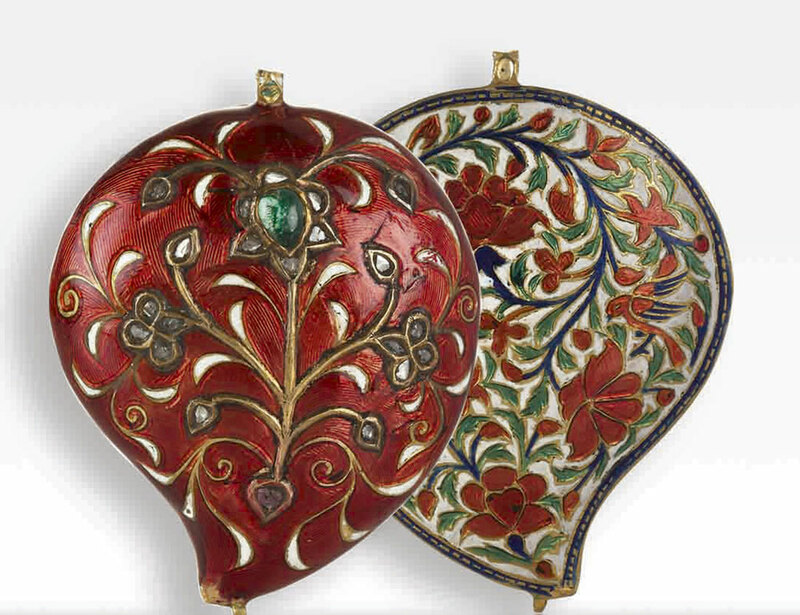 ‘Attar’ is the Persian word for perfume, it is stored in what is known as an ‘Attardani’. Made entirely in gold this attardani has a symmetrical design that transmutes throughout the surface with an array of un-cut diamonds and rubies. 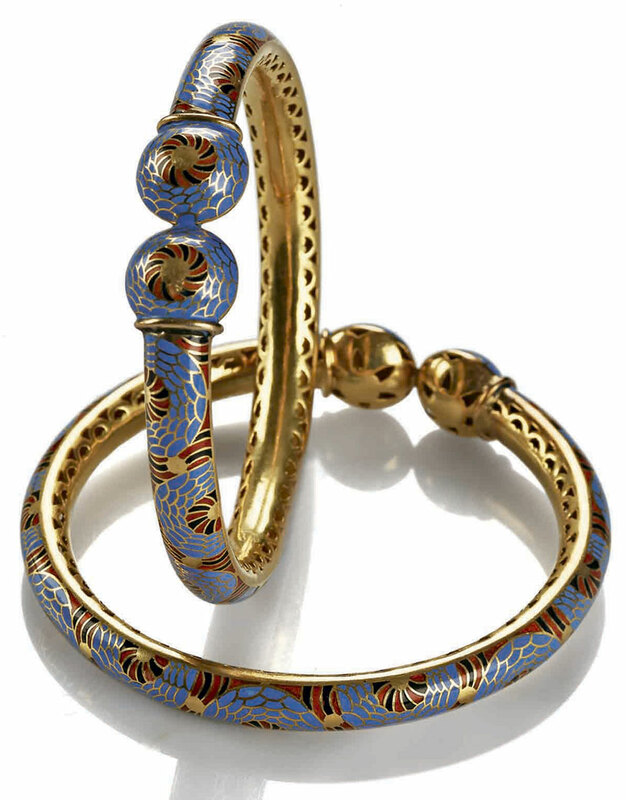 A set of two gold bangles with enamel work done in a light periwinkle blue. This shade of blue is a rare light tone that enamours the gold in the most brilliant manner. A patterned design lay across the frontal surface of the bangles, the two ends meet and weld together with an almost nautilus shaped spiral design, which is also observed throughout the pattern layout. The inlay of the bangle is displayed in a meshed gold design. A clustered gold pendant studded with precious stones, the elemental design is from South India and displays the deft craftsmanship of the jewellery maker. The frieze segment is composed of 4 gemstone studded flowers and sequentially placed diamond shaped units studded with stones. 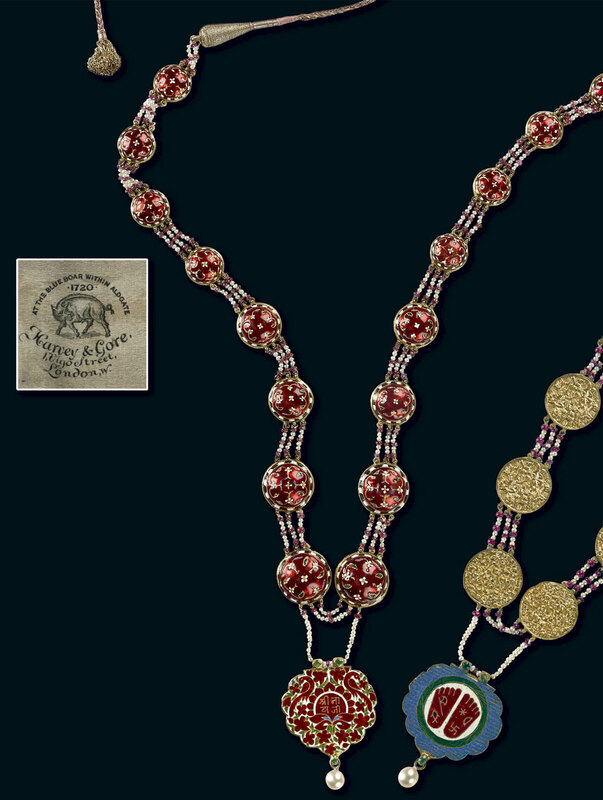 Identical clustered flowers occupy the midsection of the pendant, multitudes of miniature gold beads are hinged beneath the uppermost tier and the clustered flower tier. The pendant culminates with a suspended miniature pendant with synonymous design of the principle pendant. 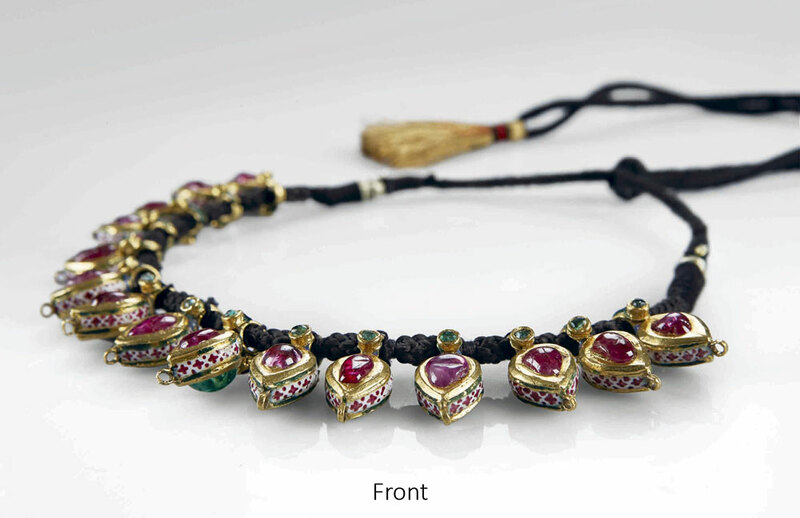 This 9 beaded necklace is an exquisite example of Meenakari work, one of the most ancient forms of jewellery designing in India. The beads are made in gold and are each in the shape of a ‘Taweez’ which are traditionally considered as amulets. The rarity of this particular piece is attributed to the setting of its precious stones. Each of the nine amulets contain one of the Navratna, or ‘Nine stones,’ on one side and an un-cut diamond on the reverse. These nine stones are theoretically considered sacred and royal when put together in almost all Asian countries, they comprise of Ruby, Pearl, Red Coral, Emerald, Yellow Sapphire, Diamond, Blue Sapphire, Hessonite and Cat’s Eye. 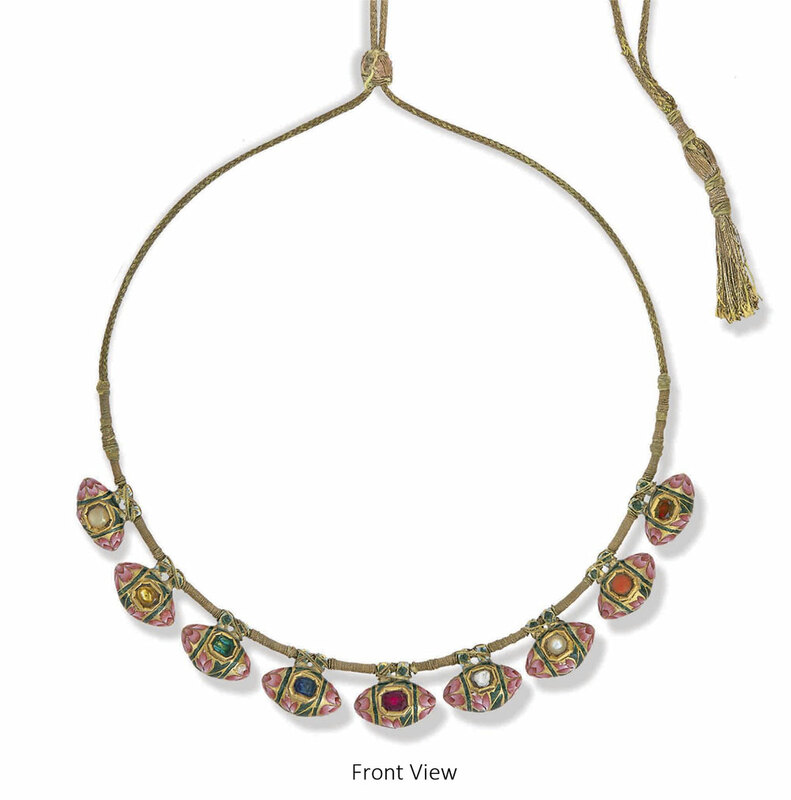 Each bead has a delicately hand worked Meenakari design of floral petals in characteristic Gulabi, (rosepink) and white enamel with a hint of bottle green detailing around the edges. A mango shaped pendant enameled in Red and white with floral design and embellished with precious stones. The frontal perspective is composed based on ‘Meenakari’ design and similar pattern has been chased in white on the reverse. 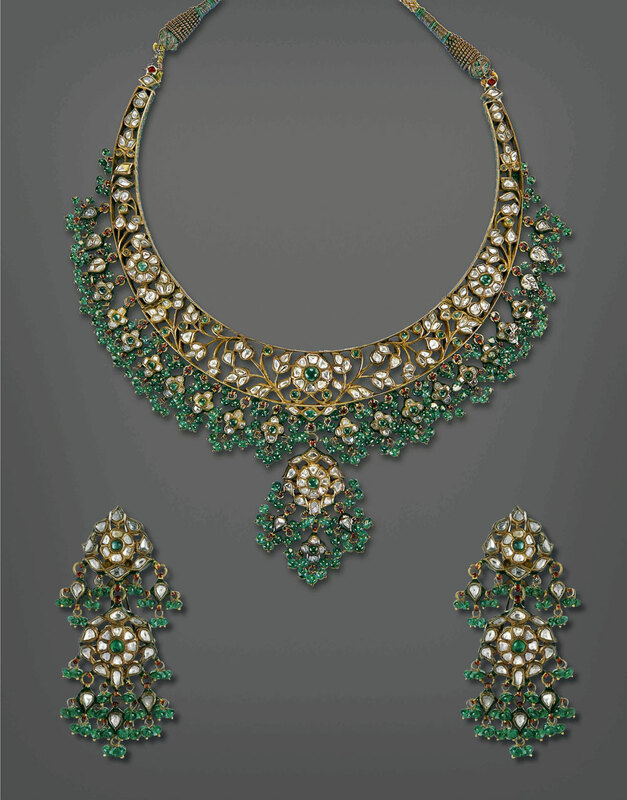 Gold necklace with emeralds and polki, with a trimmed string of pearls and culminates with a row of eloquent polki and emerald drops. 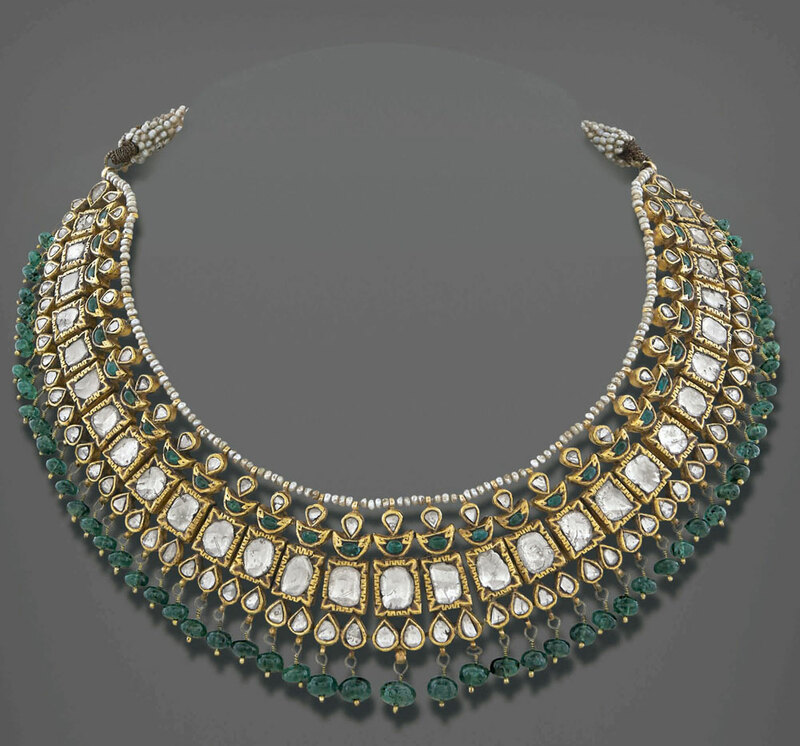 An uniform symmetrical design along the length of the necklace, alternating between polki diamonds and emeralds wound together in 22ct gold. 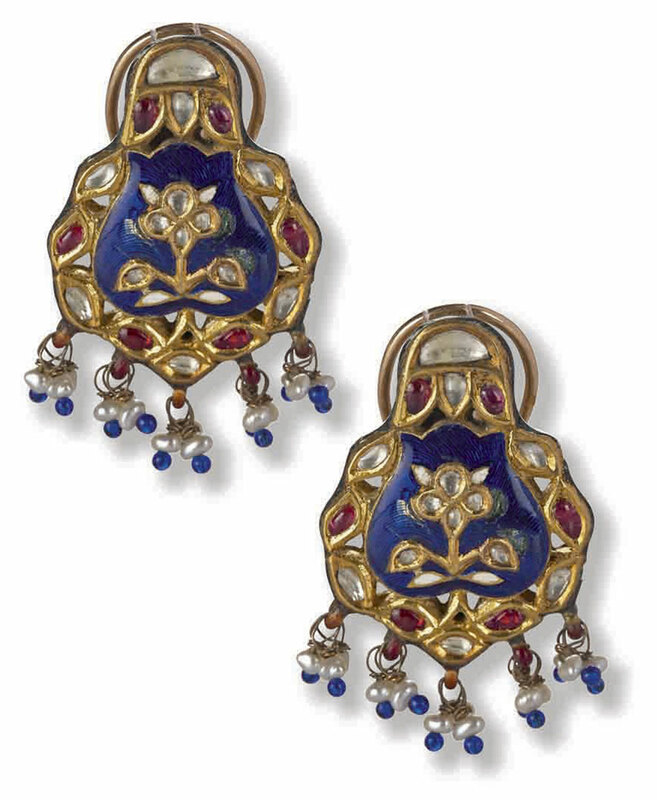 This is an exceptional pair of gold ear pendants with blue enamel open work, furthermore it has embellishment of precious stones. This is an exceptional pair of gold ear pendants with blue enamel open work, furthermore it has embellishment of precious stones. 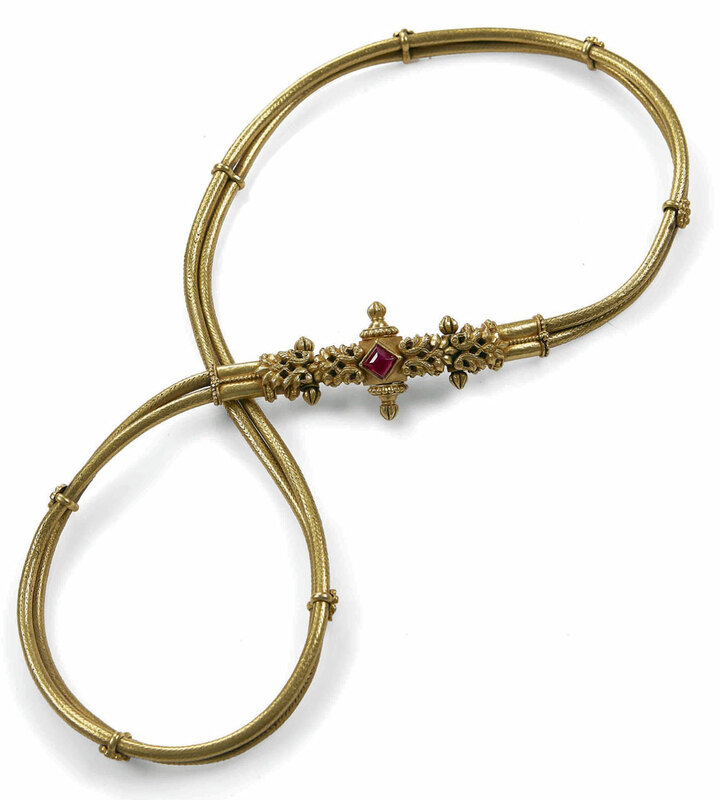 The Jadau welding technique which this ear pendants has been composed upon can be traced back to the Mughal era. Concise red and white Meenakari design work on the reverse of the ear pendants. 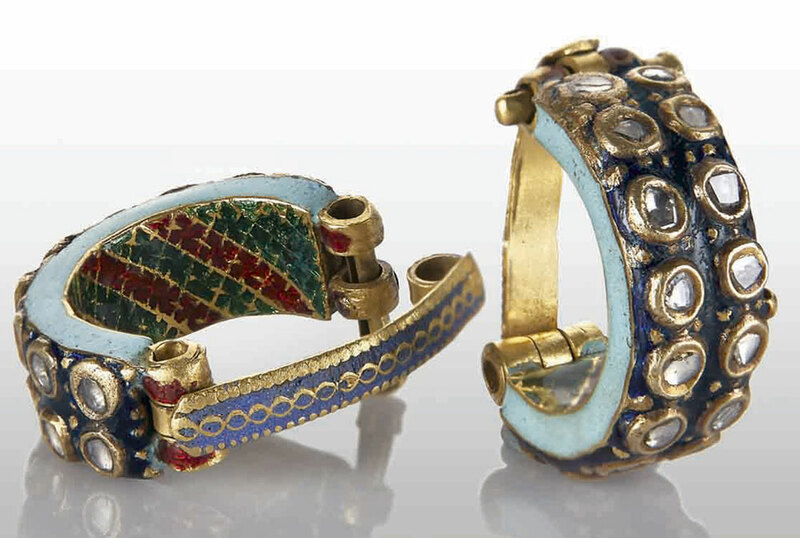 A pair of traditional toe rings from the Rajasthan region of India. Cast in gold and enameled in a shade of blue with polki un-cut diamonds. Inlay has delicate Meenakari finishing, with a slide and lock clasp. Gold bodied choker with delicately strung seed pearls that form the neckpiece, complete with a gold pendant. 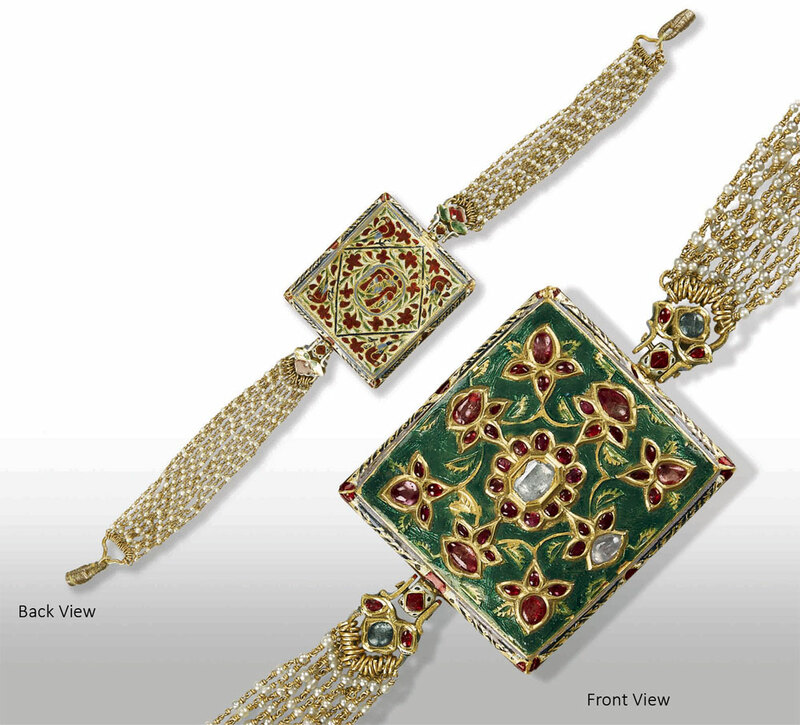 Enameled in bottle green, inclusive of rubies, kundan, un-cut diamonds and inlayed in floral motif. The pendant also has traditional Meenakari work done on the reverse with hand painted parrots. 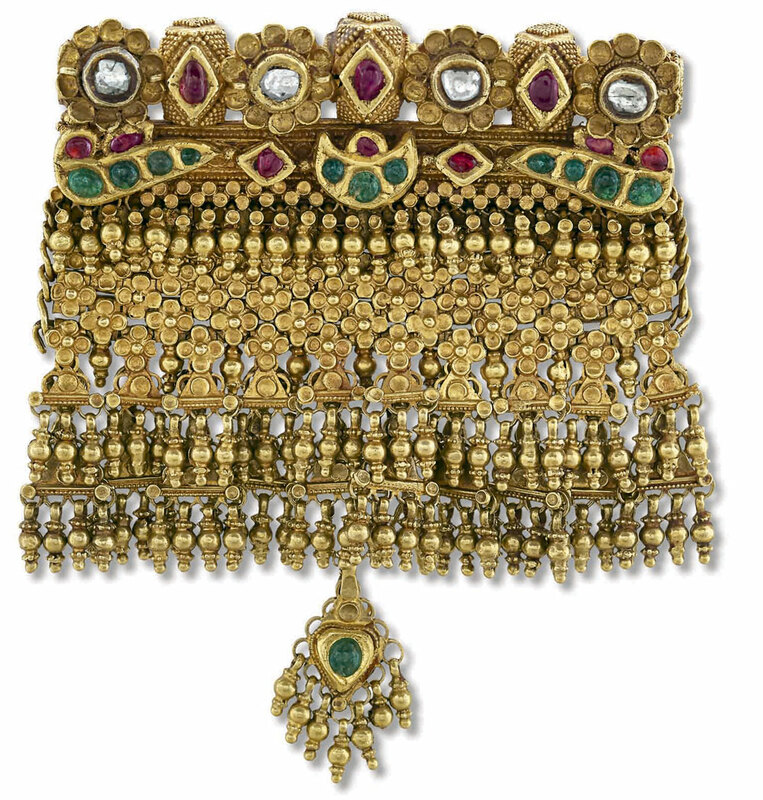 This is a solid 23ct gold cast katisutra (waistband), the two gold strands forming the band are interlocked with foliated gold flowers. The sinuous cylindrical flow of the waistband is harmoniously disrupted by an elaborate decorative buckle with a concealed clasp. 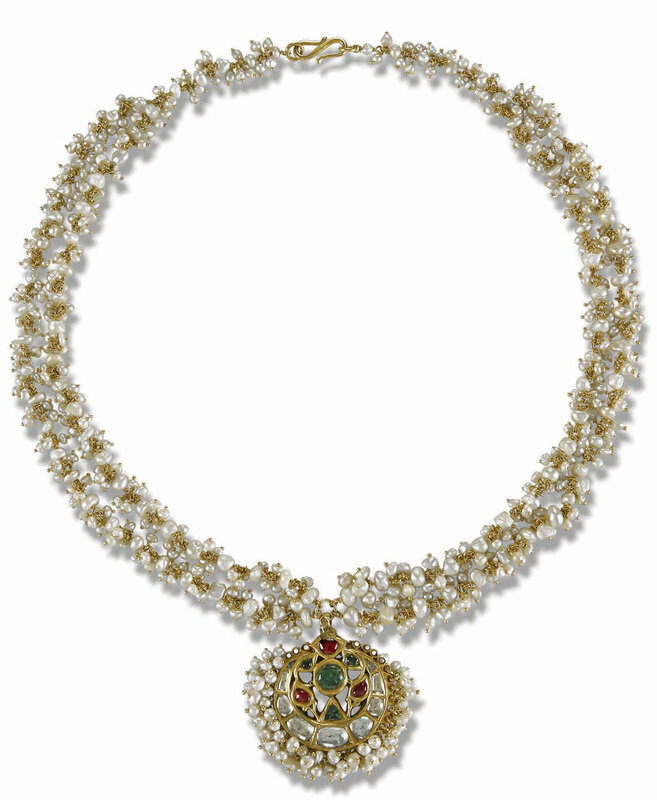 This necklace comprises of 16 graduating 22ct gold hemispheres with enamel work, strung together on multiple strands of pearls and rubies. The suspended pendant is in the shape of a Kunj leaf, inscribed in Hindi is the name ‘Shrinathji’. The pendant has a floral and peacock motif design layout. Gold embossed pattern on the reverse. This lot comes with the original box. A suite comprising of emeralds and un-cut natural diamonds. 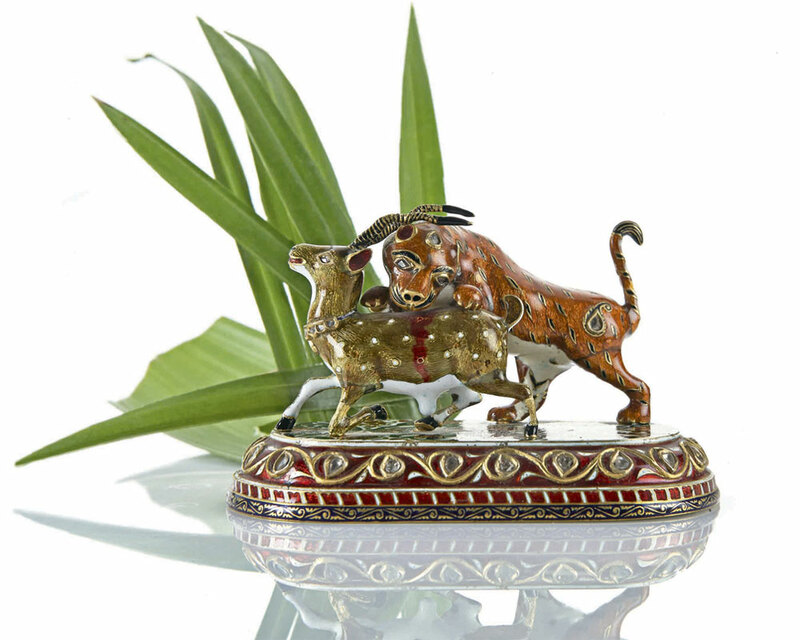 This piece had been conceived adhering to the traditional Jadau method of putting together a piece with precious stones. The primary piece of the necklace is of a permanent hold setting with a floral design. An attached drop pendant is placed in the centre of the necklace. 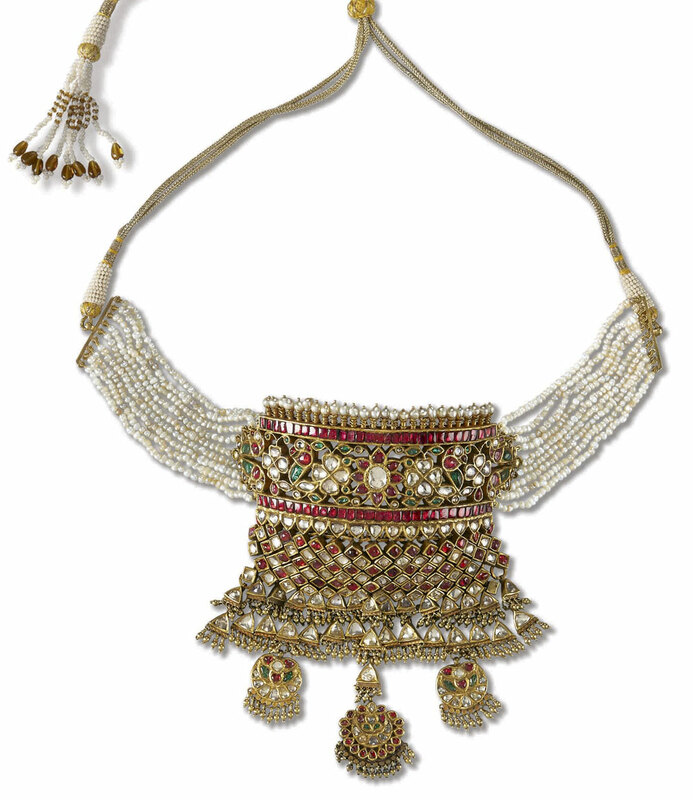 The necklace is complete with beads of emeralds and detailed Meenakari work on the reverse. The design pattern of the earrings, is in continuity with the layout of the necklace. This is a ceremonial necklace. 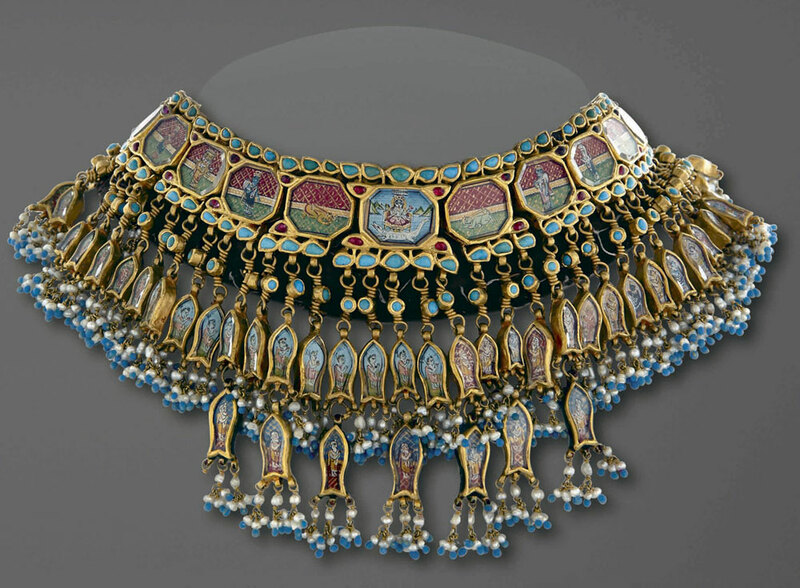 The highlight of this necklace are the 59 miniature paintings. The principle paintings in the first row depict lord Krishna seated on a thrown with Radha, surrounded by gopis. An array of miniatures depict important mythological characters including Ganesha, Brahma and Hanuman, amongst others, surrounding Krishna. The primary miniature paintings are mounted on octagon panels with turquoise drops. Gold links surmount the multiple lower tier’s pendants from a trace – link chain interspersed with natural pearls and rock crystals. 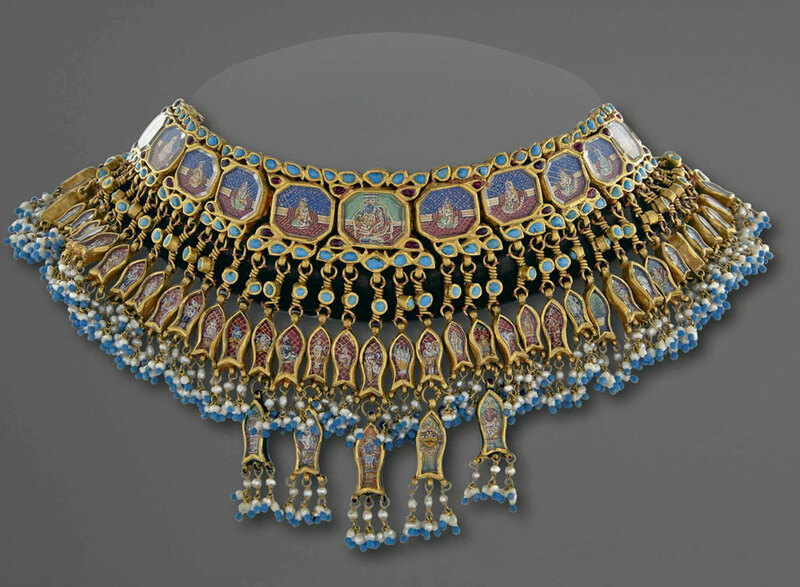 The highlight of this necklace are the 61 miniature paintings. The principle paintings in the first row depict goddess Ganga and her devotees in pious adulation, with their focus and attention channeled to her. The primary miniature paintings are mounted on octagon panels with turquoise drops. Gold links surmount the multiple lower tier’s pendants from a trace – link chain interspersed with natural pearls and rock crystals. This necklace is adorned by the imagery resembling the bud of the perennial Champa (Michelia Campaca) flower. The Champakali design for a necklace is one of India’s primordial patterns and has been adopted by goldsmiths for time eternal. It consists of 15 identical bud forms melodiously placed on a woven thread strand, highlighting the formation’s simplistic yet elegant appeal. Each of the 15 gold phalis or buds have enamel work on them and are studded with old-mine rubies and emeralds on the dual facet phalis. A necklace set in 24ct gold with two long strands of natural pearls. Suspended is a pendant of precious stones and outer border of natural pearls. Meenakari enamel work on 22ct gold with precious stones embellished. The deftly depicted hunting scene with mounted miniature figurines imparts a unique essence of narration to the piece. Inspired by a piece from the 18th century which is currently part of the Al Sabah collection. Smooth inlay of floral pattern in verdant green & Red. Continuity of design pattern is observed on the reverse. Comprising of 42 emeralds, approx carat weight of 538. 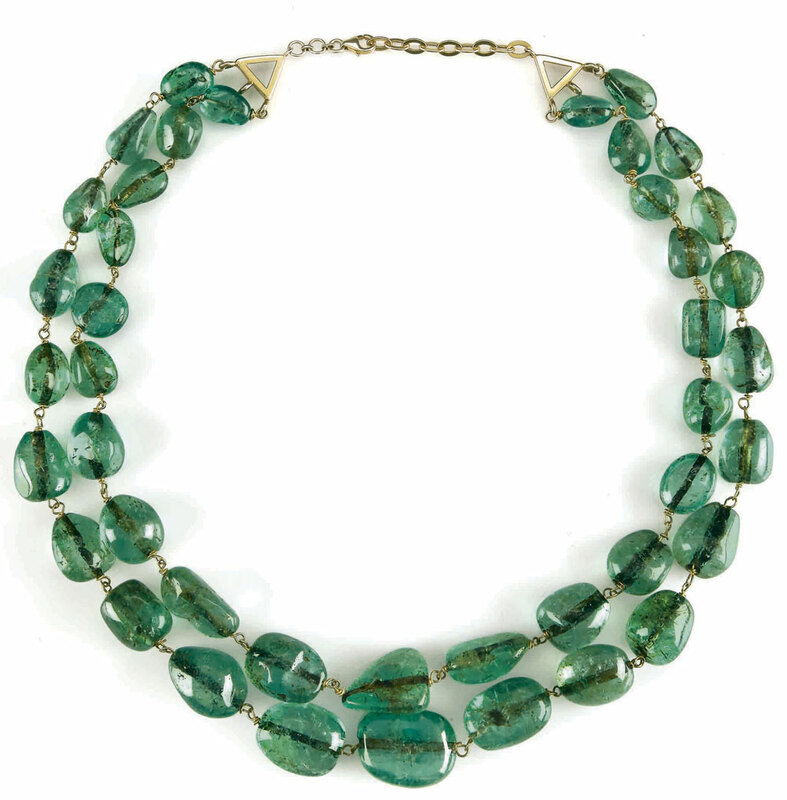 This necklace is strung together on two strands of old-mined emeralds, with a gold trace chain linking the stones. The centre stone stands at 2.5 cm in width. Set in 18ct gold, these earrings illustrate deftness of craftsmanship which brings about the vigorous beauty of un-cut diamonds set in Turkish style. Comprising of un-cut diamonds set in halo style. 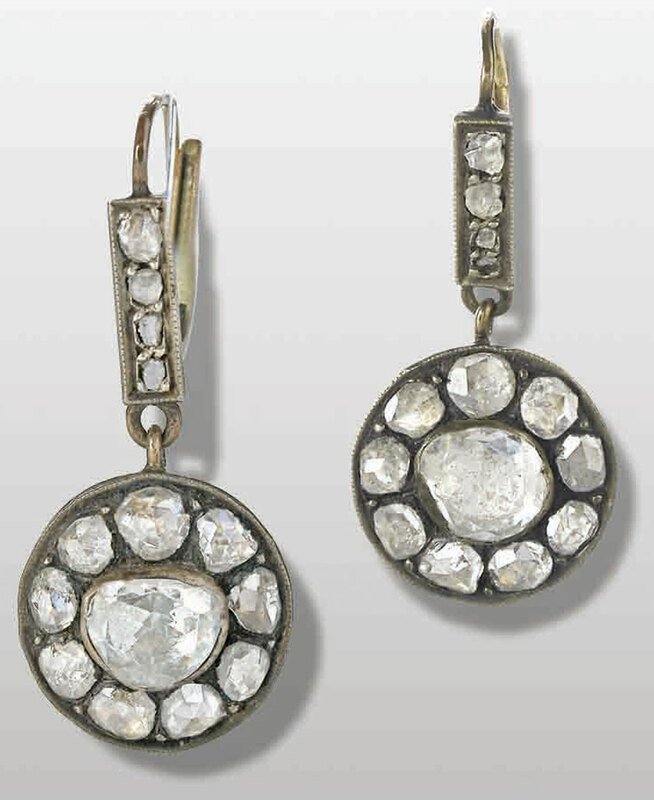 In each earring, nine circular cut diamonds circumvent the focal diamond.